Baalbek بَعلبَك is one of the most spectacular archaeological sites in Lebanon and one of the country's UNESCO World Heritage Sites. 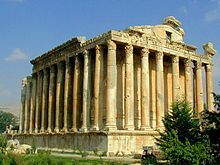 Baalbeck or 'Heliopolis' as it was known is the site of great ancient temples built by the Phoenicians, the Romans, and other civilisations that have conquered the region and enjoyed the fertile soil of the Bekaa Valley. Some of the most celebrated temples are the ones of Bacchus, the Greek god of wine, and Jupiter, the Roman god of light, of the sky and weather. Buses to Baalbek from Beirut leave the Cola intersection frequently and cost LL5,000. During the summer season daily tours are available from Beirut to Baalbeck from most major hotels; tour operator Nakhal has a guided coach tour several days a week for USD$70. The trip takes about two hours each way. It is possible to travel from Homs in Syria to Baalbek by bus. Buses leave from the Karnak or Luxury coach stations in Homs and cross into Lebanon at al-Qa'a, arriving soon thereafter at Baalbek. Cost is about USD$10. Temple of Bacchus (Small Temple). Temple of Jupiter. 1st century A.D.
Hajar al-Hubla. When you visit Baalbeck, be sure to drop by Abd an-Nabi al-Afi, the fellow who is caretaker to possibly the largest cut stone to be found anywhere on Earth (Hajar al-Hubla). He's working hard to clean up the environment a little bit, and he even offers tours of the area. Ask him to take you to the cafe up on the hill for an evening view of the valley. Every summer the Baalbeck International Festival offers performances from local and international artists. In the past performers ranged from Sting, Vanessa Mae and Phil Collins to plays by the celebrated Lebanese Rahbani brothers. Do not buy antiquities as they are most likely fake. This is the center of the fake coin industry. Insist on a certificate of authenticity, and pay by credit card and keep your receipt. At least then you can charge back the dealer when you learn you have been deceived. Real antiquities could also be from illegal digs, don't buy them either. You will probably also be touted some yellow Hezbullah T-shirts while you are at Baalbeck, as it is the birthplace of that party. If you choose to buy one beware: these T-shirts will self-destruct in the laundry, losing all of their green ink in the wash. That aside, they are an interesting souvenir. They should only cost 1,000 LL, not the 15,000 LL they'll initially give you for a price. Oriental pastries are offered by Patisserie Jawhari, there you can find traditional sweets from Lebanon, Syria and Turkey. The most famous sweet there is called "namoura bel ashta" (namoura with cream). The cream is extracted from fresh boiling milk. More pastries are found including knefe and neqlawa. Evey summer there are outdoor shesha bars, they also serve food, drinks, desserts. This park travel guide to Baalbek is an outline and needs more content. It has a template, but there is not enough information present. Please plunge forward and help it grow! This travel guide page was last edited at 15:36, on 14 January 2019 by Wikivoyage user Traveler100bot. Based on work by Wikivoyage users Ikan Kekek, Podrozniczek, Jonte--, Ibaman, Ypsilon, Saqib and Addbot, Wikivoyage anonymous users 106.77.90.201 and 91.10.186.145 and others.